Use caution when storing apples with other vegetables as they give off ethylene gas that causes other vegetables to rot. They can be stored in tubs with lids to prevent this effect. Choose varieties that are good winter keepers, like golden russet, Belle de Boskeep, winter banana, Roxbury and others. Leave the stems on. Store in plastic tubs with lids. Keep them shallow as storage too deep will bruise them. Check frequently…one bad apple rots the barrel! Can be stored late into the fall and early winter in the garden under a mulch of insulating material such as straw or hay. If bringing into the house to store in a root cellar, harvest them just before they are fully mature in the fall when nights start dropping to around 30o F. Harvest with roots and store in bins or buckets of moist sand with a loose lid*. Brussels sprouts can withstand some freezing and can be left in the garden late into the fall. Or, store them in the root cellar, but they really suffer if it is not very moist. If you want to store cabbage you need to grow varieties meant for storage. These also are more frost tolerant and can be left in the garden later than summer cabbages. If storing in a root cellar, it must be very moist. Harvest by pulling up with the roots still attached and wrap in newspaper and store in crates, or sit in a bucket of moist sand. Carrots meant for storage should be planted later in the season than summer carrots, or be very long season varieties of carrots that do not become mature until late fall. Can be stored late into the fall and early winter right in the garden under a mulch of insulating material such as straw or hay. 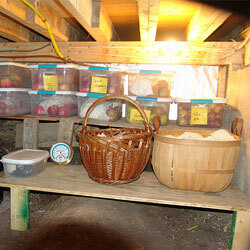 If storing in the root cellar, dig before the soil freezes and dry the surface. Remove the excess soil, cut the stem close to the carrot and pack in leaves or sawdust or in a bucket of moist sand with a loose lid*. Trim off the longer roots being careful not to cut too close to the vegetable. Shake off the loose dirt. Store the roots covered with damp sawdust, sand or moss. Celeriac is a good keeper, it is a vegetable you can count on. Harvest beans after they are mostly dry on the vine and spread out to dry for several weeks more. The beans can be removed from the pods after this drying by putting the pods in a bag and banging the bag with a bat, then cut a small hole in the bottom of the bag and the beans will fall out. Or, the plants with the pods attached can be banged against the side of a barrel and the beans will fall out. Store in dry containers with tight lids. Freezing will not harm dry beans. Harvest garlic when the tops are between a third and two thirds yellow (in central Maine this is usually early August). Air dry for 2-3 weeks in a warm, very dry place. Cut off the roots and store in cool, dark, airy place. If growing leeks for storage, choose a variety that is frost hardy and harvest late in fall. Pull up with some root and store upright in bunches close together in moist sand, but be careful not to let leaves get wet. Can be left in the garden under an insulating material until the ground freezes. They also can withstand a freeze and snow and be harvested in January. Onion varieties differ greatly in their ability to be stored over the winter. Some will make it no longer than until Christmas and others can hold well into the spring. Harvest onions after the tops have fallen over. Onions need to be cured well and the necks tight and dry before putting into storage. For curing, they can be spread out on a dry floor in an airy place, or hung up side down with their tops hanging through slats of something like pallets. Store in crates or mesh bags in a dry, airy place. May be stored in the ground covered with mulch and dug and enjoyed in the spring. Flavor improves with frost. Parsnips keep well in the ground uncovered until the ground freezes. If they have been nicked with a shovel while digging, enjoy those soon. Store unbruised parsnips in damp sawdust. Harvest after the potato vines have died and there has been a killing frost. Cure potatoes in a dark place at 45-60o F for 10-15 days, then move to a long term storage site. Store in barrels or crates in the dark. If they begin to sprout it is a sign it is too warm, break them off. Treat pumpkins like squash. Be sure the stem is still intact, as ones without stems don’t store well and should be cooked and eaten or frozen. Shrivel easily. Bury them in damp sawdust, moss or sand. Some folks use beeswax to cover them and retard moisture loss. Native Americans called the Jerusalem Artichoke sunchokes. They keep well right in the ground all winter. Toss hay over the bed to keep it from freezing and dig until the soil freezes hard. They will keep in the root cellar for a few weeks in a plastic bag or in damp sand. Can keep until spring if they are well stored. However, if conditions are not right and the potatoes are bruised, they will quickly spoil. Harvest the crop as soon as the frost has killed the vines. Dig carefully to avoid nicking or slicing and let air dry for a day so the soil brushes easily from them. Cure them at a warm temperature (80 – 85o F) and 90 percent relative humidity for 10 to 14 days. This toughens the skin and improves the flavor. Then wrap each potato individually in newsprint and store in a basket in an unheated room at around 50 to 60o F.
Bring in before a heavy frost. Cut off the tops. Store like carrots packed in damp sawdust, moss or sand. Trim off the leafy tops and store like carrots. Harvest when fully mature (thumbnail should not penetrate skin with moderate pressure). Taste and sweetness is very dependent on the squash seeds being fully mature before harvest. Harvest before a hard frost. Leave stem on fruit. Cure in warm temperature (75-85o F) for about 10 days, then store in a place with little temperature fluctuation, without letting the temperature ever drop below 50. * When storing vegetables in moist sand, sawdust, leaves or moss, be sure to harvest in cold weather and not put in cellar until temperatures are 40 or below to avoid mold problems.